Last week I gave a walking tour of the Hayward fault along the Oakland-Berkeley border. Among other things, I talked about the fault's peculiar behavior called aseismic creep, in which the two sides of the fault move slowly past each other at just a few millimeters per year without the help of earthquakes. I pointed out places where creep has been gently distorting the streets. I explained that creep doesn't remove much earthquake energy because it only affects shallow parts of the fault that can't store much energy anyway. But I couldn't say much more about it because geologists studying the creep problem have lots of questions, several hypotheses, and no answers. 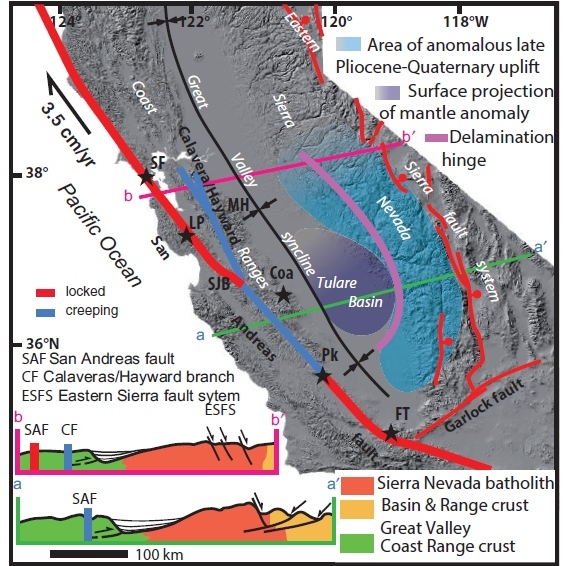 Just days later, the September issue of the journal Geology came out with a paper that makes an intriguing connection between our creeping faults and slow activity on the other side of the Sierra Nevada microplate, where the Earth's outer shell is secretly splitting apart. Fault creep is quite uncommon in general, but a big central section of the San Andreas fault complex is creeping today while on either side the fault is locked, building up energy for large earthquakes like the 1906 quake in Northern California and the 1857 Fort Tejon quake in Southern California. The so-called creeping section runs from the village of Parkfield east of Paso Robles up to San Juan Bautista. Near there the Calaveras fault splits off from the San Andreas, and in turn the Hayward fault splits off from the Calaveras—and both of those faults also creep. See them shown in blue in this figure from the Geology paper. The authors are Laetitia Le Pourhiet, a French geophysicist, and Jason Saleeby, a geologist at Caltech's Tectonics Observatory who has studied the southern Sierra Nevada for decades. 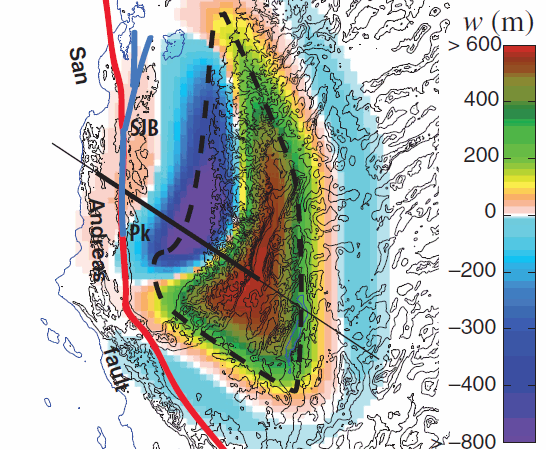 Figure 1 of Le Pourhiet and Saleeby, "Lithospheric convective instability could induce creep along part of the San Andreas fault," Geology v. 41, p. 999-1002 (Sept. 2013). Stars mark notable earthquakes in (north to south) 1906, 1989, 1983, 2004 and 1857. One of Saleeby's most interesting lines of research is exploring how the dense rocky root of the southern Sierra broke off (delaminated) and sank into the hotter, softer mantle beneath to form a "lithospheric drip" starting about 4 million years ago. On the east side of the Sierra, the mountains responded by springing upward to create the dramatic eastern face that includes Mount Whitney, highest peak in the 48 states. The "Big Drip", if I may call it that, is bending and twisting the rest of our microplate. On its west side, the drip is still attached and pulling down on the crust. 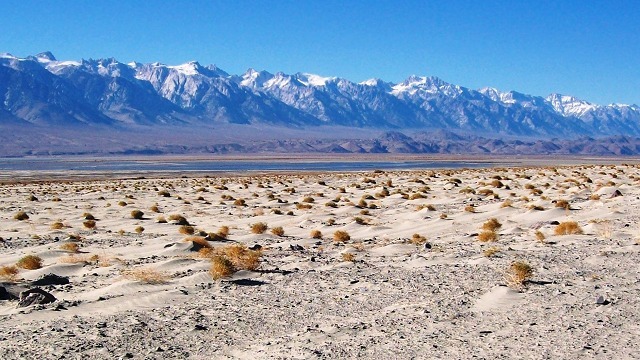 The result is that the southern Great Valley is at its widest and deepest there, in the Tulare geologic basin. If you think of the Earth's crust across central California as an air mattress floating in a pool, imagine a swimmer grabbing it in the middle from below and pulling down. The east end (the Sierra) bends upward and the middle (the Tulare basin) bends down. What happens farther west? Le Pourhiet did the computer modeling to show that the west side of the microplate arches upward by a hundred feet or so. That side is pinned against the San Andreas fault so it can't simply break and spring upward like the eastern Sierra, which is being pulled away from Nevada. Part of Figure 3 of the Geology paper; colors show the calculated vertical movements in response to the Big Drip. So is any of this a scientific fact? Not yet; it's just another good hypothesis that fits a variety of data but needs refinement. Scientific consensus is when everyone accepts a good hypothesis and moves ahead because they've run out of good counterarguments. We definitely haven't reached that point for the San Andreas fault system. 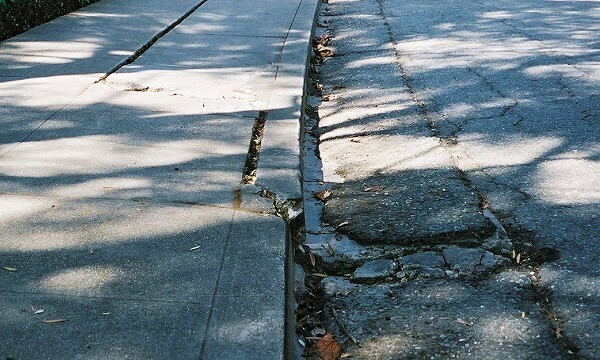 In the meantime, I can show you examples of Hayward fault creep in Hayward, in Fremont and in Pinole.